In the June issue of ELLE UK, Miley Cyrus dishes on her much talked about relationship with fiancé Liam Hemsworth. It remains unclear if the interview was done before rumors surfaced of a split and a postponed wedding. Rumors that the couple’s engagement had been called off first surfaced in March. “I am so sick of La. And sick of the lies that come with it. I didn’t call off my wedding. Taking a break from social media. #draining,” Cyrus tweeted at the time. Earlier this month, insiders claimed Cyrus and the Hunger Games actor had put plans for a summer wedding on hold to “figure out their life together.” “They’re still engaged and living together. They just realized that there is no rush with the wedding and that it’s better that they wait a bit,” a source told People magazine. The June issue of ELLE UK will hit newsstands on May 1. Up next for Cyrus is the release of the first single from her upcoming album. The song will feature Snoop Lion. Wednesday’s 2013 People’s Choice Awards honors the best in television, music and movies — as chosen by the fans themselves. Hosted by Kaley Cuoco, the show is airing LIVE from the Nokia Theatre in Los Angeles. According to film distributor Lionsgate (September 10), the second installment of the “Hunger Games” franchise, “Hunger Games: Catching Fire,” has begun filming in Atlanta, Georgia. The film is helmed by Francis Lawrence (“I Am Legend”) and will also shoot in Hawaii before wrapping in December. “We are so excited to be embarking on this adventure with Francis Lawrence, who has already exhibited immense creative vision and resourcefulness in casting the film and planning its look and feel,” Lionsgate’s President of Production Eric Feig said. “The Hunger Games: Catching Fire” is due in theaters November 22, 2013. Philip Seymour Hoffman has reportedly joined the cast of Catching Fire. E! News reports the Oscar winning actor has signed a deal with Lionsgate to play Plutarch Heavensbee, the new Head Gamemaker. “The deal was made right before the Fourth of July holiday,” an insider says. Neither Lionsgate nor Hoffman, 44, has commented. Catching Fire will begin filming in the fall with Jennifer Lawrence returning to play Katniss Everdeen. Josh Hutcherson will reprise his role as Peeta Mellark and Liam Hemsworth will return to play Gale Hawthorne. Francis Lawrence will replace Gary Ross as director. Catching Fire is set to hit theaters in November 2013. Robert Pattinson set tongues wagging, not for the photo call of his latest movie Cosmopolis, but because he’s been linked with a surprise role in the new Hunger Games movie, Catching Fire. Think McFly Think say they’ve got the skinny on casting for the next two Hunger Games movies and that RPattz is up there to play the super handsome Finnick Odair, who won the games aged just 14. Finnick encounters Katniss Everdeen played by Jennifer Lawrence during some hairy scenes in the second installment and is a key character. Should he accept the role he’ll be back under the helm of Water For Elephants director Francis Lawrence. But for now Robert will be focusing on his time at the Canne Film festival and Cosmopolis, the movie about a millionaire who’s Manhattan trip to get a haircut leads to a life changing sequence of events. Other actors on the sequel wish list are Zac Efron, Chace Crawford and Twilight co-star Kellan Lutz. The action movie slayed the competition in its debut weekend, grossing $155 million. The Hunger Games, starring Jennifer Lawrence, Liam Hemsworth and Josh Hutcherson, became the most popular midnight opener ever for a non-sequel when it debuted in the U.S. with a stunning $19.7 million in the early hours of Friday, and its winning streak continued throughout the weekend. The whopping opening weekend takings have catapulted The Hunger Games in to the record books once again, making it the biggest non-sequel film to ever open at number one. It is now also the third best opener of all time, only falling behind last year’s Harry Potter and the Deathly Hallows: Part 2 and 2008 Batman film The Dark Knight, which raked in $169.2 million and $158.4 million respectively. Cop comedy 21 Jump Street and Dr. Seuss’ The Lorax round out the top three spots on the new U.S. box office chart. Meanwhile, The Hunger Games, the first movie adaptation of author Suzanne Collins’ books, also struck gold at the global box office, grossing $214.25 million outside the U.S. Launching at an eye-popping 4,137 total theaters, Lionsgate isn’t being shy about pushing “The Hunger Games” into the vision of moviegoers everywhere. “The Hunger Games” also has a tremendous built-in audience due to the popularity of the book series it’s based on, which should combine with positive critical buzz so far to make for a very big opening. With midnight screenings likely to be sold out, the only question right now is just how big its opening totals will be. 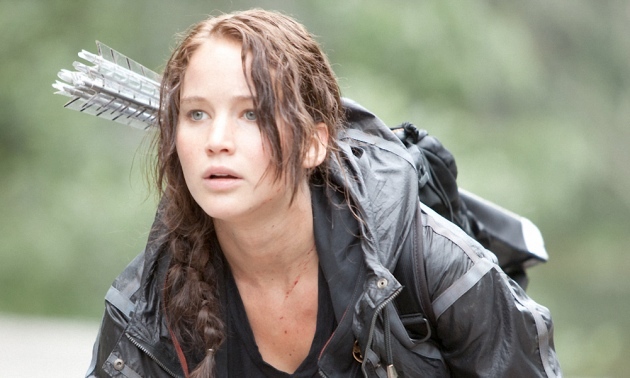 The only real downside for “The Hunger Games” is its PG-13 rating. Though it has a big enough fan base to potentially make this mostly a non-factor, “The Hunger Games” doesn’t have the advantage of a family-friendly PG rating, which “Alice in Wonderland” had when it hit theaters in 2010. Still, “The Hunger Games” is launching at roughly 400 theaters more than “Alice,” potentially giving it enough of a boost to surpass the March record.